This news article was issued by the American Geophysical Union (AGU) as a press release on 25 January 2018. A new study published in Water Resources Research, a journal of the American Geophysical Union, estimated the global amount of phosphorus from human activities that entered Earth’s freshwater bodies from 2002 to 2010. Phosphorus is a common component of mineral and manure fertilizers because it boosts crop yields. However, a large portion of phosphorus applied as fertilizer is not taken up by plants, and either builds up in the soil or washes into rivers, lakes and coastal seas, according to the study’s authors. The results of the new study show global human activity emitted 1.47 teragrams (1.62 million U.S. tons) of phosphorus per year into the world’s major freshwater basins, four times greater than the weight of the Empire State Building. The study also assessed whether human activity had surpassed the Earth’s ability to dilute and assimilate excess levels of phosphorus in fresh water bodies. The authors found phosphorus load exceeded the assimilation capacity of freshwater bodies in 38 percent of Earth’s land surface, an area housing 90 percent of the global human population. “In many areas of the world either there’s not enough water to assimilate the phosphorus or the pollution load is so huge that the water system can’t assimilate everything,” said Mesfin Mekonnen, a post-doctoral research associate at the University of Nebraska in Lincoln and co-author of the new study. The study’s results indicate freshwater bodies in areas with high water pollution levels are likely to suffer from eutrophication, or an excess level of nutrients, due to high phosphorus levels, said Joep Schyns, a researcher in the field of water management at the University of Twente in Enschede, the Netherlands, who was not connected to the new study. The authors of the new study examined agricultural activity to calculate the total amount of man-made phosphorus entering Earth’s surface water from 2002 to 2010. They gathered data on how much fertilizer is applied per crop in each country, and estimated domestic and industrial phosphorus production by looking at protein consumption per capita per country. “Other studies have calculated global phosphorus loads, but we went farther because we broke down the phosphorus load by various categories such as different crops, countries, and economic sectors, which no one has done,” Mekonnen said. The new results show human activity released 1.47 teragrams (1.62 million U.S. tons) of phosphorus into the world’s freshwater bodies each year. China contributed 30 percent of the freshwater phosphorus load, followed by India at 8 percent and the USA at 7 percent. The largest contribution to the global Phosphorus load came from domestic sewage at 54 percent, followed by agriculture at 38 percent and industry at 8 percent. The authors found the phosphorus load from agriculture grew by 27 percent over the study period, from 525 gigagrams (579,000 U.S. tons) in 2002 to 666 gigagrams (734,000 U.S. tons) in 2010. Can Earth’s Freshwater Bodies Cope? The study also estimated the water pollution level (WPL) of Earth’s major river basins by comparing the amount of fresh water needed to dilute the excess phosphorus to an allowable concentration compared to the basin’s actual river runoff. If a freshwater basin has a WPL above one, water quality standards are being violated and the basin is receiving more phosphorus pollution than it can assimilate, Mekonnen said. 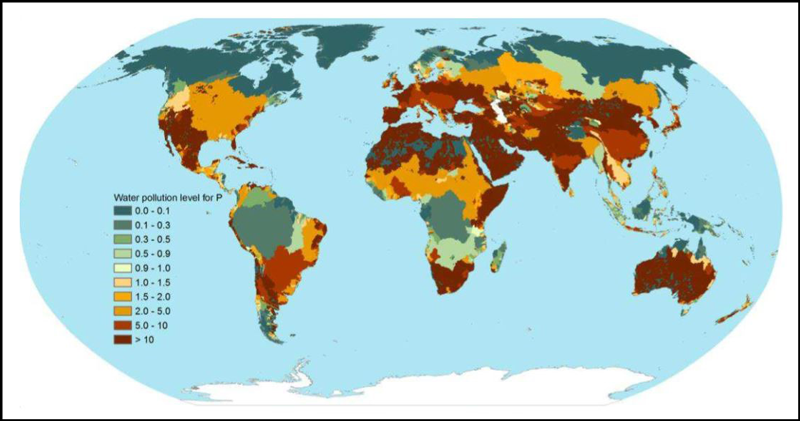 The results show freshwater basins with a WPL above one cover 38 percent of Earth’s land surface, excluding Antarctica. These basins often pertain to densely populated areas or regions with intensive agriculture, according to the authors. The most severely polluted freshwater areas include Aral drainage basin, the Huang-He (Yellow) river in China, the Indus and Ganges rivers in India and the Danube river in Europe. Less-populated regions such as Australia and northern Africa also suffer from high water pollution levels, according to the new study. These regions have smaller phosphorus loads compared to areas like China and Europe, but they have much less water available to accommodate their excess phosphorus, Mekonnen said.